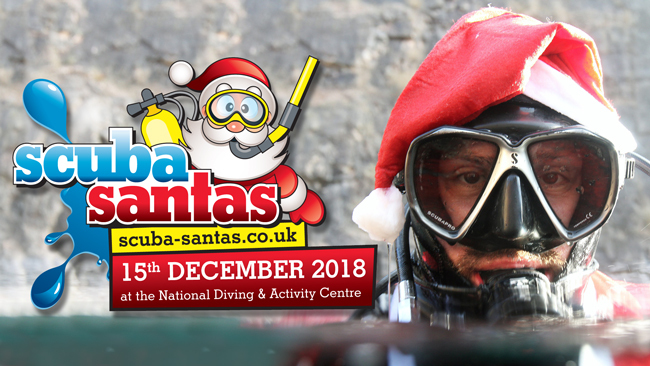 Sign-in and pay as normal in the shop and register for Scuba Santas in the marquee. We will have a raffle with a variety of prizes on offer and all proceeds will go to our designated charities. We will also have mince pies and scones on offer. This means our members will only have to pay £6.50 for a day’s unlimited diving with us and non members will have to pay just £9.00. No catches – just turn up, book in and scuba dive for half the normal price! We look forward to seeing you at the National Diving & Activity Centre (NDAC) in Chepstow between now and Saturday 16th December. Sunday will be back to full price so we can raise as much as possible for the Scuba Santas Charity event. This offer cannot be used in conjunction with any other special offers from the NDAC. Keep an eye on our website, Facebook Page and Twitter Feed for further offers and promotions throughout the year. Normal entry requirements for Scuba Diving apply.